The destruction of a Cardassian freighter near DS9 is learned to have been caused by Federation citizens turned terrorists, calling themselves the Maquis. The citizens opted to stay on planets given to the Cardassians in a treaty with the Federation — and they’re taking up arms in response to subsequent treatment by the Cardassians. Sisko fears that tensions stoked by the terrorists will cause another war with Cardassia, so he teams up with Gul Dukat (Marc Alaimo) to stop the Maquis. But he learns that his old friend and fellow Starfleet officer Calvin Hudson (Bernie Casey) is one of the terrorists and plans to attack a weapons depot the Cardassians have placed on one of their colonies. Sisko takes DS9’s three runabouts and stops Hudson from attacking the depot, and allows Hudson to escape. 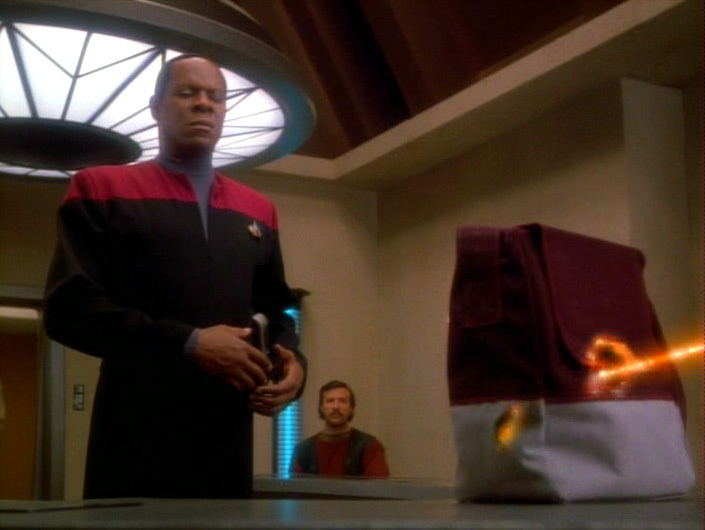 Sisko is commended for his actions in preventing a war — but wonders if he simply delayed the inevitable. If anyone questions’s DS9’s importance in Trek lore, they should watch this two-parter. It’s the first time we see DS9 as a sort of crossroads in galactic politics. It’s the nearest Federation outpost to the Cardassian border, so Sisko and Co. are drawn in — even though it’s unlikely their roles could have been anticipated by anyone when Starfleet set up shop at DS9 a little more than a year earlier. The Maquis are a huge Trek domino, of course. The events here are set in motion by TNG’s “Journey’s End” and are furthered by TNG’s “Preemptive Strike”. The second season of DS9 and seventh season of TNG are interesting as they’re the most coordinated concurrent seasons in Trek history. With Voyager taking place out of the Alpha Quadrant, this kind of cross-cutting between series never happened again. But, of course, Voyager’s very premise — a Starfleet crew and and a Maquis crew forced to work together on the other side of the galaxy — was set in motion by the events of this DS9 two-parter and the two related TNG episodes. Beyond that, the Maquis are a major force in DS9. They helped destabilize the Cardassian Empire, which becomes part of the Dominion three years later BECAUSE of its instability. And the guy who forged the Cardassian/Dominion alliance was Gul Dukat … who really comes into his own as a major DS9 player in these episodes. His scenes with Sisko really were incredibly well acted and well written. 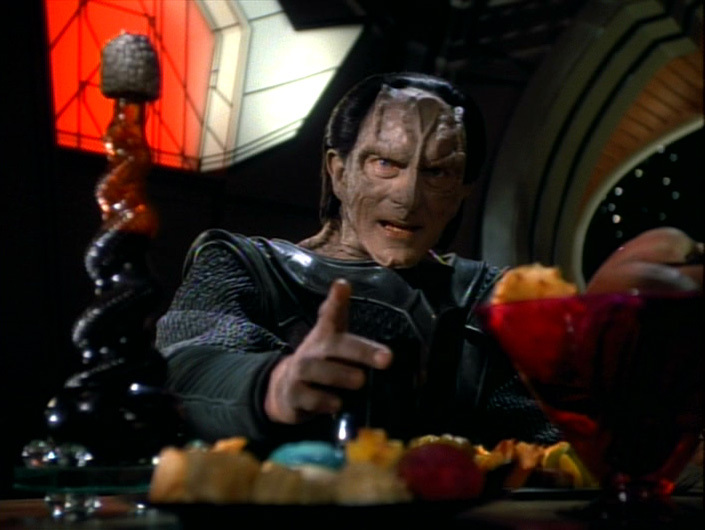 Prior to “The Maquis”, Dukat was really a recurring character/Cardassian. His personality wasn’t fleshed out — he was just the former Cardassian prefect of Bajor who appeared on view screens here and there. But this episode established him as a major foil for Sisko and the DS9 crew. One, who for a couple seasons, was an ally. This, of course, was one of DS9’s strengths. No other Trek series was so good at embracing shades of grey. We’ll discuss another one of those shades, Garak, in our next review. 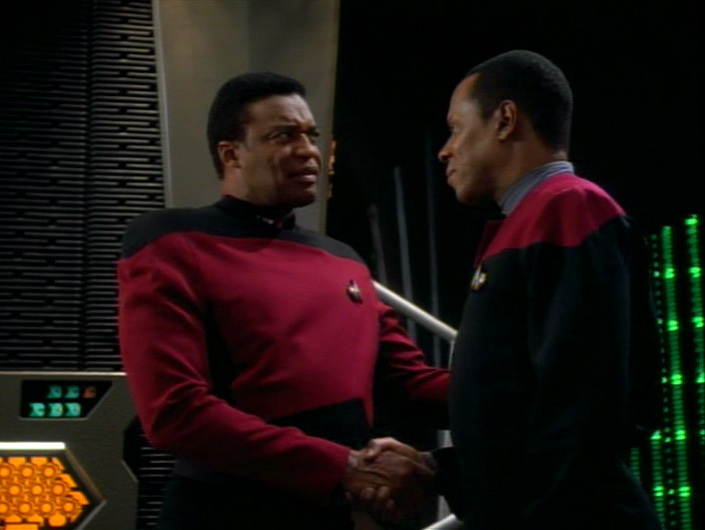 Bernie Casey isn’t great in this episode, but that’s largely forgivable. The biggest problem after that is the issue of scope — something DS9 struggled with early on. Sisko and Co. must take on the Maquis with the station’s three runabouts. While they are successful in doing so, it’s a really close call — and only works because the Maquis have limited resources. It’s kind of goofy to think that Starfleet wouldn’t have sent a starship to deal with the Maquis. Had that happened, the ship would have pretty easily handled a couple of (well-armed) shuttles — but, then, Sisko and company would have likely been left on the sidelines. This, of course, is addressed in season three when Sisko brings the Defiant to DS9 to address the Dominion situation. But it’s hard to swallow that Starfleet couldn’t have devoted more resources to diffuse matters with Hudson here. We know there are Federation starships in the general area (as the Enterprise spends much of the seventh season dealing with Cardassian matters). I’ve had friends ask me when they should start watching DS9, and I usually tell them that these two episodes represent the turning point. There are definitely some good episodes in the first season-plus — notably, the Bajoran political stuff from the end of season one into season two. But I understand why those episodes don’t have the mass appeal that we got starting in this two-parter. This is also a great example of the DS9 characters getting their footing. The crew was never going to be as conflict-free as the TNG gang, nor did it need to be (nor was it designed to be). But the over-the-top writing/acting from season one is gone here. The scene in part one where the senior staff is clearly at odds — I love when O’Brien calls Odo out for security breaches — is great. No other Trek series did this kind of thing as well. Sisko’s growing importance is shown here. He’s not just some bureaucrat tasked with getting Bajor ready for Federation membership. He’s a guy who must deal with terrorist groups and Cardassian reactions (in addition to Bajor). Later, of course, he becomes the guy to deal with the Dominion threat. Last point. You’ll notice that many of the next several episodes make the tapestry, as DS9 enters a stretch of really consequential stories. You could argue that DS9 becoming more consequential was the key to its improved performance. We finally learn what’s up with Garak. Sort of. Maybe.